The Federal Reserve reported that industrial production gained in December for the third time in four months, despite a weak showing for manufacturing. Utilities and mining led the monthly gain. The Fed said industries expanded output by an annual rate of 8.2% in the fourth quarter, partly driven by a rebound following hurricanes Harvey and Irma. For the year, industrial production increased 3.6%, the largest year-to-year gain since 2010, the first full year after the recession. The same report showed capacity utilization, a leading indicator of inflationary pressure, rose to its highest point since February 2015 but stayed well below its long-term average. The pace of home building stalled in December, according to the Department of Commerce. Housing starts were on a 1.19 million-unit annual pace, down 8.2% from November’s pace and down 6% from December 2016. The rate remained above recessionary levels but was less than half of the 2005 peak. 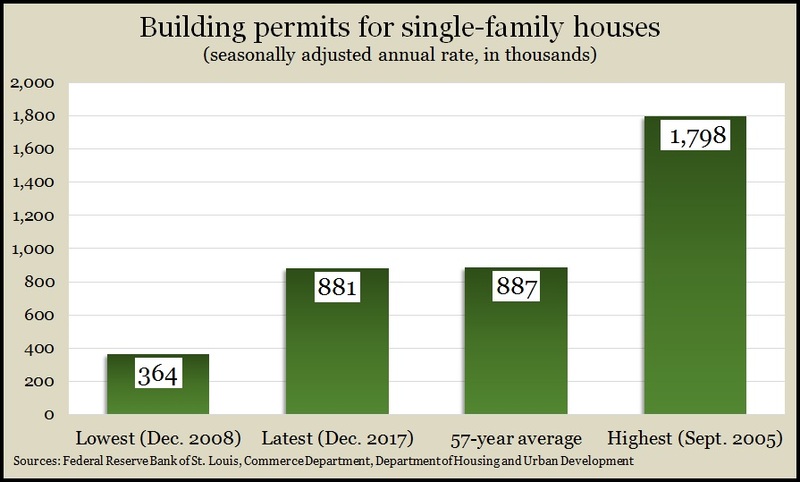 The same report – whose figures are volatile month-to-month – showed a slower pace for building permits, although mostly because of declines in multi-family housing projects. Authorizations for single-family houses have risen four months in a row and reached the highest rate since August 2007. That suggests a continued moderate pace in housing starts, which housing economists say is not keeping pace with demand. The moving four-week average for initial unemployment claims fell for the first time in five weeks, as data settle from the ebb and flow of temporary year-end holiday hiring. The leading indicator of firings and layoffs remains 31% below the 50-year average, where it has been each week since the beginning of 2013, according to Labor Department data. That suggests employers continue to be reluctant to let workers go, a sign of labor market strength that should help fuel consumer spending. A preliminary look at January consumer sentiment from the University of Michigan surveys suggested Americans are feeling slightly less confident about economic conditions. Overall sentiment remains near 17-year highs, according to the university’s longstanding index. In particular, consumers are relatively content with their personal financial situations and short-term spending plans. Consumer spending accounts for more than two-thirds of U.S. economic activity.